Nice camo pants! Love the sandals! Love this casual look. I just love your effortless style! Such a simple and such a perfect outfit! I love your tee and bracelet! so gorgeous!! love the pants. Love the look. Gorgeous shoes. Such a cute outfit. Casua, chicl & comfortable, nothing better than that. Never would have thought to put camo and stripes together but I love it! So cute!! LOVE this look! It actually makes me want to buy a pair of camo pants. I really like this print mixing and those shoes are amazing! 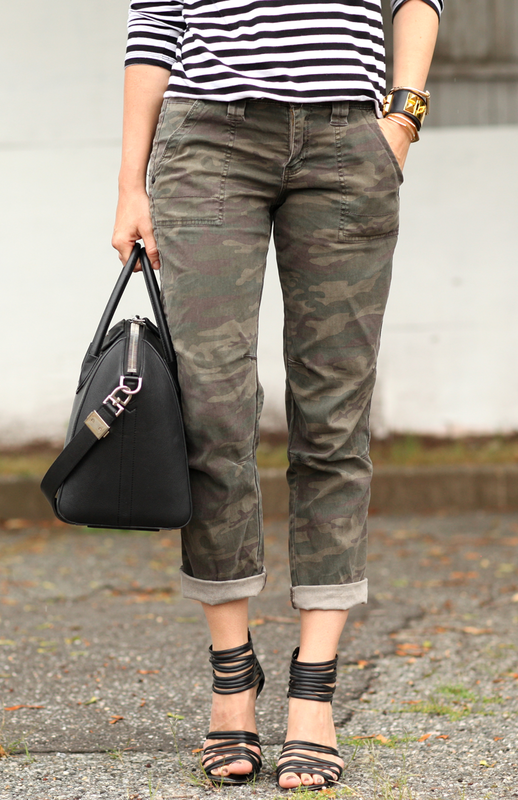 Love how you've combined masculine and cool elements such as camo pants with the feminine, bright lipstick. This look is simply gorgeous! Great combo. I love how you stuck to all-black accessories! Such a cute outfit. I really love your shoes!! Yesss love this combo! Great pants. Never would have put these two prints together. Thanks for this inspiration! Love this outfit. Could wear this all day. LOVE these strappy shoes, wish they were still available! Nice Photos! Your Photographer always takes amazing shots. These trousers look lovely! I am not wearing jeans but these cuties look like a great alternative to jeans. I also adore the bag – there is never enough black leather bags, right? Love the mixed prints, very chic and great for fall! Camo is my jam. I love mixing prints! Pinning!! Love these two prints together! You are looking beautiful and cute in this outfit. You always wear amazing outfits. Today i love most in your outfit is Camo Pants,Herve Leger shoes and Bracelets. I love the combination of prints! Such a great combination! I love this look! Fun mix of prints! Loving your top! Love the shirt! I can never get enough of stripes! Love the mixture of patters. Camo and stripes look so good togheter.